Werner's Cairns blog: Health benefits of prunes. We all endeavour to stay healthy and eat healthy food and fruit, and one of those is the prune, as well as the plum. The word prune is a versatile word in the English language, we prune a tree or our budged etc, but we can also eat it. A dried plum becomes a prune and that’s why we keep mentally active so that our brains don’t take on the appearance of a “shrivelled up” prune. Besides that, eating prunes is good for you. Prunes remind me growing up on the family farm and my mother converting some of our plums to prunes on a timber rack in the sun. They were the better substitute and much better to take than castor oil, to keep us kids regular. In fact prunes are recognised the world over as a very effective natural laxative. Prunes are also quite a nutrient rich fruit, and are famously known for their unique taste and exceptionally high fibre content. The nutrient richness of prunes goes beyond helping to stay regular. Prunes are a source of many health promoting compounds including protein, vitamin A, K, C, E, B6, thiamine, riboflavin, niacin, folate, pantothenic acid, calcium, iron, magnesium, phosphorus, potassium and zinc. Following is and interesting article. 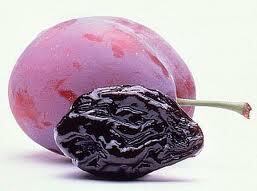 And, for further interesting information about prunes click here - and here - Starting as a plum. Dried Plums May Help Women Lower Blood Cholesterol Levels after Menopause. In an animal model of postmenopausal hormone deficiency, dried plums suppressed a rise in blood cholesterol without affecting HDL (good) cholesterol associated with the onset of menopause, according to a study conducted at Oklahoma State University. At menopause, women’s risk for coronary heart disease drastically increases due to loss of oestrogen. Options for lowering cholesterol include a diet rich in plant fibre and other protective nutrients. Although hormone replacement therapy (HRT) often is used to prevent the rise in blood cholesterol associated with menopause, HRT may not be suitable for all women. In addition, some women may prefer a dietary approach to reducing blood levels of cholesterol. One possible way might be eating foods that provide dietary fibre such as dried plums. Dietary fibre, especially soluble dietary fibre such as pectin, has been shown to lower blood levels of cholesterol in both humans and animals. The study showed that including the equivalent of about 10-12 dried plums in the diet of ovarian hormone deficient animals prevented the rise in total and non-HDL blood cholesterol levels. Postmenopausal women who are not on HRT and who are seeking ways to lower total cholesterol might consider including fibre-containing foods such as dried plums in their daily food choices. Dried Plums May Play a Role in Bone Health. An animal study conducted at Oklahoma State University discovered that the equivalent of 10-12 dried plums prevented bone loss associated with oestrogen loss at menopause and that the equivalent of about 3-4 dried plums restored bone loss in an animal model of early postmenopausal bone loss. Dried plums completely stopped and were able to reverse bone loss in an animal model for post-menopausal osteoporosis. The mechanism responsible for this is not known. The mechanism might be related to the plant phenolic compounds, the sugar alcohol sorbitol, the mineral boron, or dried plums' ability to impact absorption of minerals. A small clinical trial is underway to determine whether any of these observations in the animal model can be seen in postmenopausal women. Dietary Fibre in Dried Plums Helps Lower Blood Cholesterol Levels. A study at University of California, Davis showed that adding 12 dried plums to the daily diet can significantly increase the dietary fibre intake for those seeking this dietary goal. Adult men with mildly elevated levels of blood cholesterol supplemented their usual diets with 12 dried plums (100 grams having 6 grams of dietary fibre, over half of which is pectin) daily. Levels of LDL-cholesterol were significantly lower after the dried plum period than another fruit juice control period. This is one of the first studies that tested the ability of pectin-containing foods to lower blood cholesterol levels. Previous studies used purified pectin rather than natural food sources. The report encourages careful selection of fibre containing foods rather than the use of isolated fibre supplements as part of overall positive changes in eating habits. Dried plums and prune juice contain significant levels of phenolic compounds. Phenolic compounds contribute colour and sensory properties like bitterness to food, and often function as antioxidants. Phenolic compounds have been associated with reduced incidence of heart disease by protecting low density lipoprotein (LDL or “bad” cholesterol) from oxidation. A study at the University of California, Davis analysed dried plum and prune juice extract for phenolic compounds. The main compounds detected in both dried plums and prune juice were the hydroxycinnamates, especially neochlorogenic acid and chlorogenic acid. Both dried plums and prune juice inhibited LDL oxidation in vitro indicating that dried plums and prune juice may provide a source of dietary antioxidants. How to post a comment? Click on annotation to enlarge and find out. Thanks for that Werner.A good reminder, We now only have them twice a year, I keep forgetting about them. My mum often gave us prunes with our cereal in the mornings. At boarding school they never served it up to us little ones and we were given tablets for that, every Sunday night. Right up my alley Werner.... I'm a prune lover since childhood! Thank you.